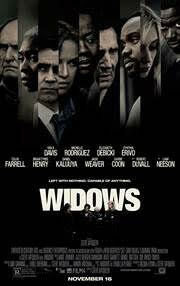 “Widows” begins with Harry Rawlings (Liam Neeson) and his partners in crime meeting a quick, fiery end, before we even really get to know any of them. But we quickly learn that the ripples from their deaths have major implications on a bitter election campaign in one of Chicago’s most blighted neighborhoods, along with millions in dirty money that needs to be repaid. Unfortunately caught up in all this, is three grieving widows. Veronica (Davis), Rawlings’ widow, decides to use a notebook left behind by her late husband, detailing his next planned heist, to prevent herself from being another victim. “Widows” is the kind of movie we’ve seen before. Any number of political thrillers, revenge, or crime and heist movies come to mind. But what makes “Widows” unique is how much it subverts tropes or incorporates them into themes that touch upon racism, police brutality, class warfare, gender politics, and more. Sometimes the themes are heavy, layered on thick so that a general audience can understand. Other times they’re casually sprinkled in, only coming through the film’s visual aesthetics or the director’s incorporated camera techniques. The blueprint for “Widows” could have easily been used to craft a well-made summertime popcorn flick that would have delighted the masses. “Widows” will still delight those masses, but it’s nourishing because of the sustenance it finds in the script and it’s performances. When the film could have easily told the audience what’s happening, it shows it. And when the actors could have easily read through plot points and pertinent topics, they etch everything we need to know on their faces and through their actions. Davis, who should seriously be on everyone’s radar in Hollywood by now, channels a primal feminine rage about the destruction left behind by the men in her life, whether it be personal or circumstantial. Rodriguez and Debicki, playing the other two widows brought in for the all-female heist, feed off of Davis’ energy. Even in scenes where Davis’ is paired alongside any of her male cohorts, she seems to tower above them in terms of dramatic acting chops. 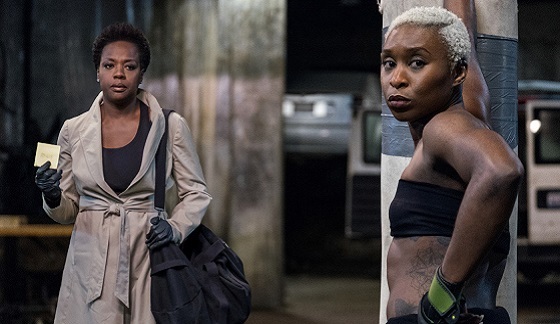 There is no small role in “Widows” as the likes of Colin Farrell, Jacki Weaver, Matt Walsh, and others provide another layer for viewers to peel back. The nuances of every role in this film beef up the main players, but also supply much life to an already bleak backdrop. Steve McQueen has entered the mainstream with a stellar ensemble crime heist film that interjects weighty thematic material that’s easily digestible and relevant. “Widows” is one of the must-see films of the years, for general audiences and cinephiles.